Black Britannia features striking portraits by John Ferguson, Fleet Streets first black photographer in the 1980’s, of some of the most well known – and less familiar – black men and women who have risen to the top of their chosen fields in the UK. Under the title Black Britannia, the full exhibition comprises of 55 portraits of inspirational black Britons who inspired personally the artist in the past or who are currently making great strides in public life. Of the 55 black Britons, some well know names such as Sir Trevor McDonald, Lenny Henry, Naomi Campbell, Paul Ince, Lewis Hamilton, and others from various occupations such as head teachers to supermodels, boxers to lawyers – these are people from all walks of life. The exhibition had a very successful extended run in London, where it then moved on to Liverpool’s slavery museum for a six month run. It is currently being exhibited by Oldham Arts council, Greater Manchester. 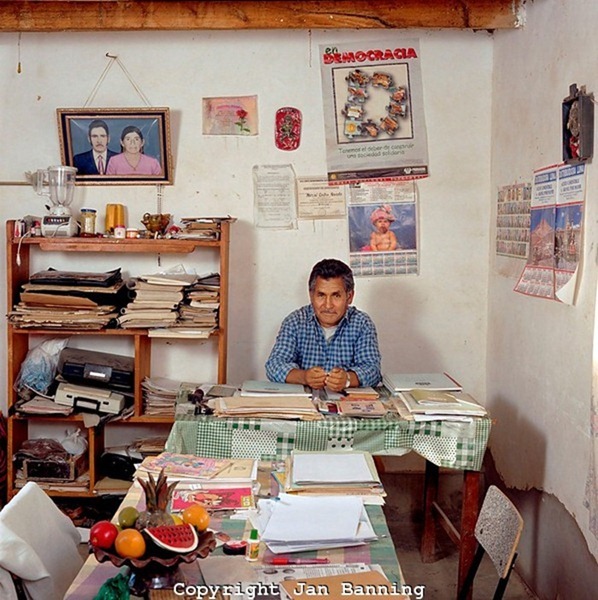 John is an experienced documentary and environmental portrait photographer working out of London and UK. He has travelled extensively working for leading national and international newspapers and magazines as well as NGO’s. From the raise of the Aids/HIV pandemic in Africa and Asia, to feature stories from conflicts zones in Afghanistan and Iraq. John as talent for conceptualisation and delivering strong and innovative ideas and works well in a team environment, taking direction as well as working independently. 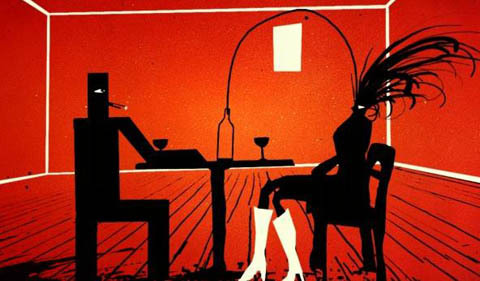 His work as also covered various celebrity and high end editorial and commercial work. In 2009 John’s first solo exhibition ‘Black Britannia’ was opened by the then Prime Minister Gordon Brown at London City Hall. He is currently finishing a two year personal project which as gained interest from a leading Sunday Supplement in the UK. Ironic world of Psychospa, the world which reflects a modern man living in a metropolis, unsociable and full of fears and anxieties but “attracted” to nature. A person, who does his best to achieve harmony of his body and soul and in so doing, wishes to stay young and healthy. Driven by a “set of procedures” such as therapeutic mud baths, volcanic minerals, plants, chocolate and honey his inner energy awakes in him. The man turns into a strong and resolute creature with a significant moment of clearing the body of “chemical and toxic waste”. Fogoncito, a Mexican franchise, opened its second branch in Beijing, China, showing the growing taste for different foods. Almost 200 people a day visit Fogoncito to eat “exotic dishes” like tacos and enjoy the music of Mariachi. Although such musical groups usually consists of at least three violines, two trumpets, one Mexican guitar and one vihuela (high pitched guitar) one guitarron (acoustic bass) and sometimes a harp, Fogoncito provides a small sample of that with three musicians. Nevertheless, the Mariachi do dress the part in their silver studded charro outfits and wide brimmed hats. And, they can belt out a song. This trio is learning how to survive-Beijing style.As China economically integrates with the rest of the world, Mexico products are making inlays. Products such as Bimbo bread are lined on the shopping shelves. The element of surprise was crucial. 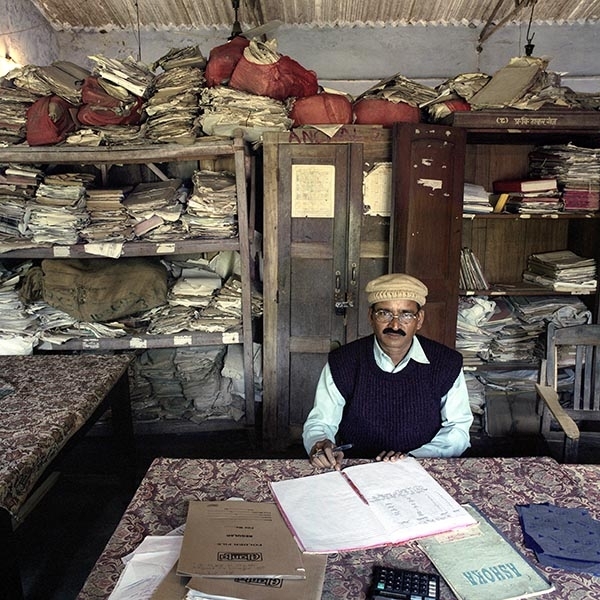 Given any warning, the bureaucrats would try to tidy their workspaces, but Banning wanted to see each office in all its cluttered glory, just as an everyday citizen would encounter it. Sushma Prasad (b. 1962) is an assistant clerk at the Cabinet Secretary of the State of Bihar (population 83 million) in The Old Secretariat in the state capital, Patna. She was hired “on compassionate grounds” because of the death of her husband, who until 1997 worked in the same department. Monthly salary: 5,000 rupees ($ 110, euro 100). Surinder Kumar Mandal (b. 1946) is circle inspector of taxes in Thakurganj block, collecting taxes in a specific part of Kishanganj district, State of Bihar. Monthly salary: 9,500 rupees ($ 208, 189 euro). Surinder Kumar Mandal (b. 1946) is “circle inspector” van belastingen in Thakurganj Block, Kishanganj district, State of Bihar. Maandsalaris: 9,500 rupees (euro 189, US$ 208). Typeroom in the Finance Department of “the Old Secretariat” in the state capital Patna. The seemingly rusty old typewriters are awaiting use: the department is supposed to be 40% understaffed. The presence of several snoring employees gives a different suggestion. Qu Shao Feng (b. 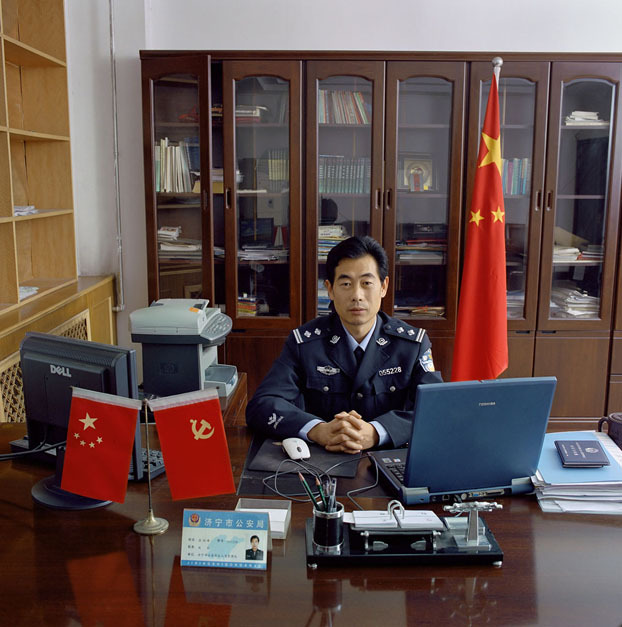 1964) is chief general of Jining Public Security Bureau Division of Aliens and Exit-Entry Administration in Jining City, Shandong province. Monthly salary: 3,100 renminbi (US$ 384, 286 euro). Wang Ning (b. 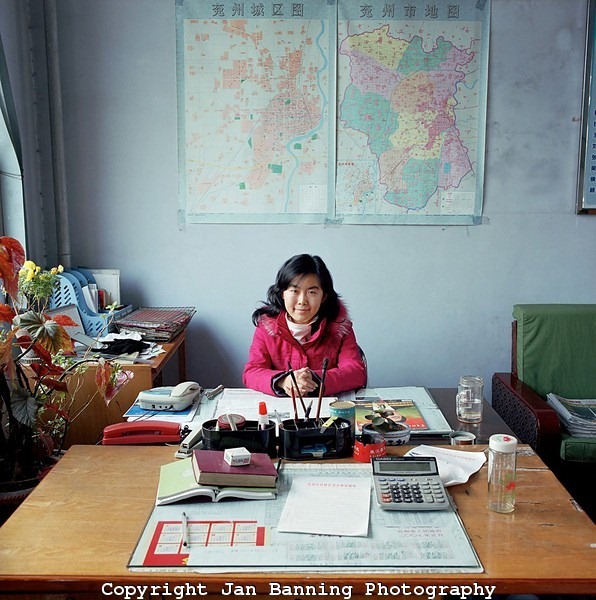 1983) works in the Economic Affairs office in Gu Lou community, Yanzhou city, Shandong province. She provides economic assistance to enterprises in her region and is the liaison officer between the government and local enterprises. Wang Ning is not married. She lives at home with her parents. Monthly salary: 2,100 renminbi (US$ 260, euro 228). Roger Vacher (b. 1957) is a narcotics agent with the national police force in Clermont-Ferrand, Puy-de-Dome department, Auvergne region. Monthly salary: euro 2,200 (US$ 2,893). Maurice Winterstein (b. 1949) works in Clermont-Ferrand for the Commission for the Advancement of Equal Opportunity and Citizenship at the combined administrative offices of the Auvergne region and the Puy-de-Dome department. He also is in charge of the portfolio of religious affairs, Islam in particular. Monthly salary: euro 1,550 (US$ 2,038). 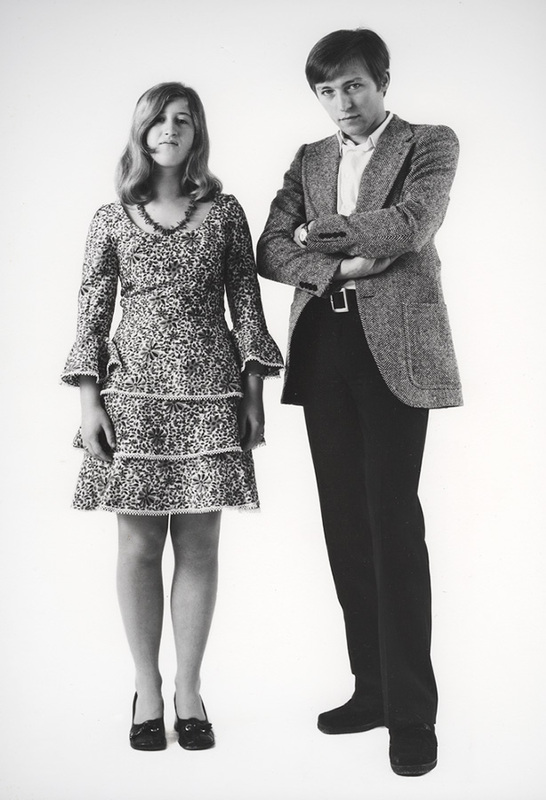 The young lady next to him is Linda Khettabi (b. 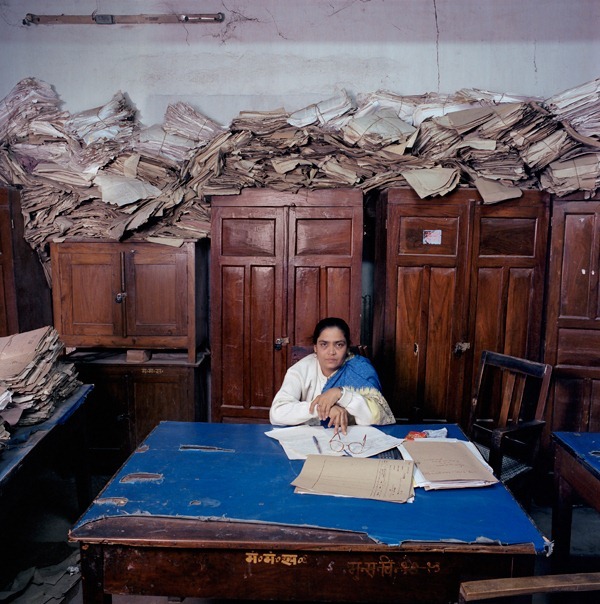 1989), an intern pursuing training as a secretary. 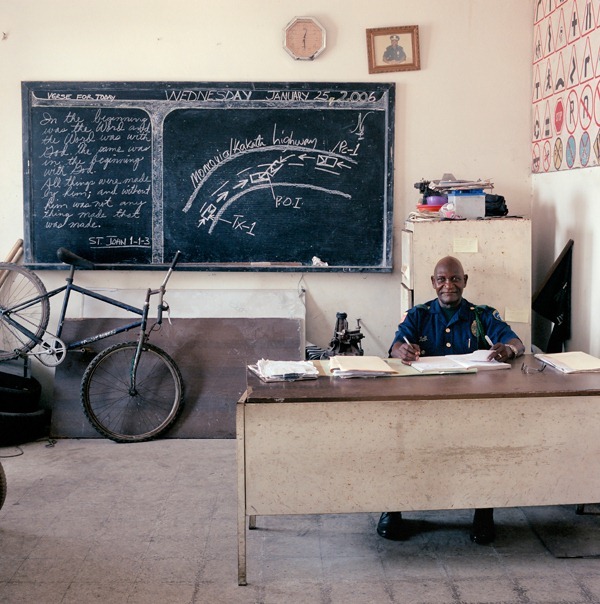 Major Adolph Dalaney works in the Reconstruction Room of the Traffic Police at the Liberia National Police Headquarters in the capital Monrovia. Traffic accident victims at time are willing to pay a little extra if Dalaney’s department quickly draws up a favorable report to present to a judge. 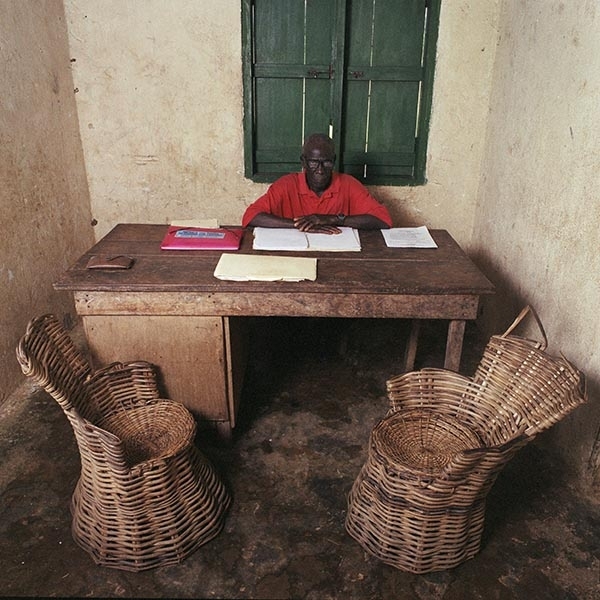 Monthly salary: barely 1,000 Liberian dollars ($18, €17). Henry Gray (1940), acting commissioner for Gbaepo district, Kanweaken, River Gee County. During the Civil War, the office was completely looted and destroyed: only one wall remained. Gray has 11 personnel, of whom only 4 are paid. The rest are volunteers. He has no budget and over two years salary owing. Yesterday, he went to the capital Fishtown to collect last two months salary, two times 975 Liberian dollars (2x US$ 17, 2x euro 16). All he got was 600 dollars (US$ 11, euro 10). Gray is father to 34 children (sic), 13 of them depending, and has 18 grandchildren. Nikolajevich Ilyich Volkov (b. 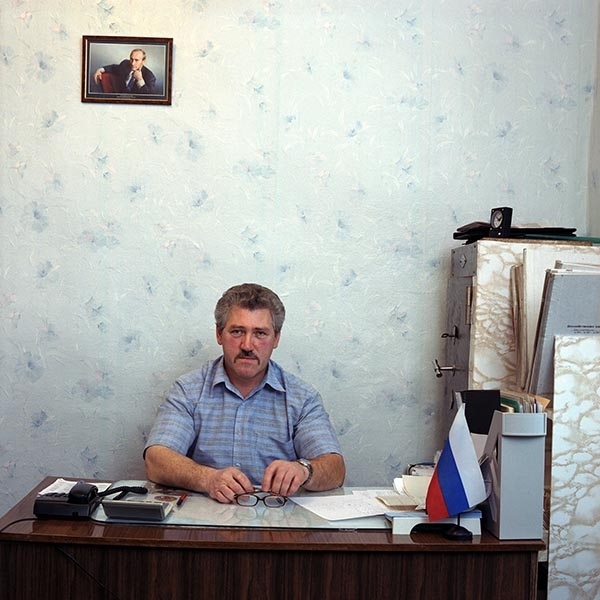 1954) is administrator of the village of Alexandrovskoye (some 1,000 inhabitants), Tomsk province. Monthly salary: 9,000 rubles (US$ 321, euro 243). Rudy Flores (b. 1963) is one of the 118 Texas Rangers, state law enforcement officers who cover 254 counties between them. 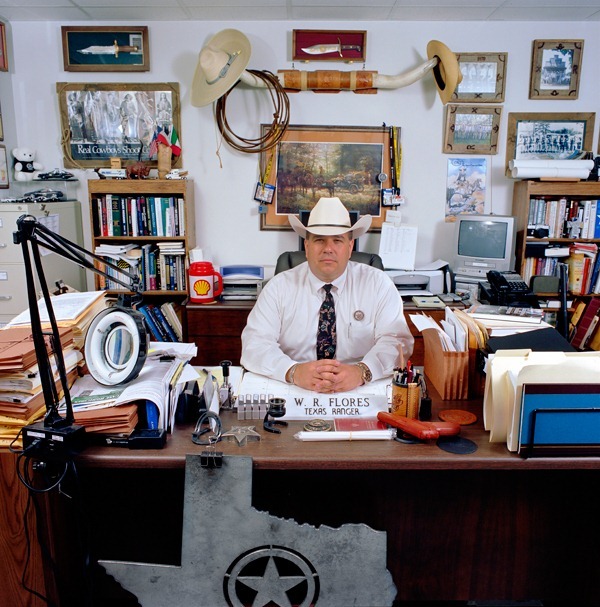 He is based in Palestine, Anderson County, Texas, and is responsible for three counties. Monthly salary: $5,000 (€3,720). Dede McEachern (b. 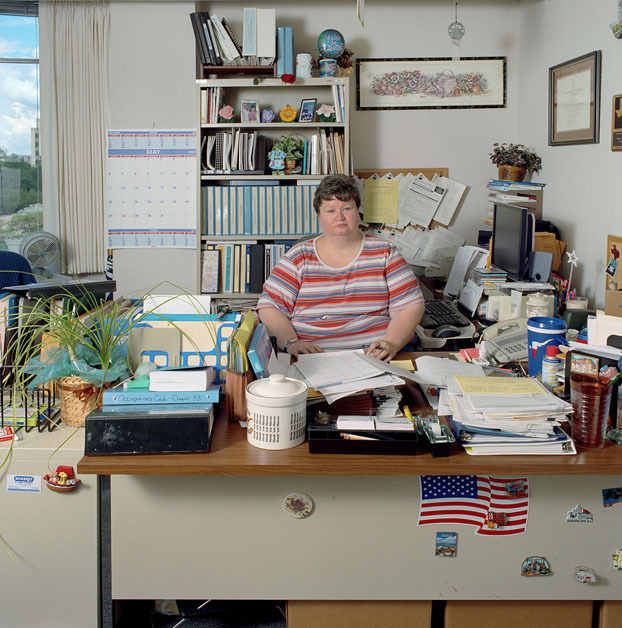 1969) is director of licensing, Texas Department of Licensing and Regulations, in the state capital, Austin. Monthly salary: US$ 5,833 (euro 4,240). Ali Abdulmalik Shuga (b. 1964) is responsible for the archives of the Ministry of Trade and CommerceÍs governorate s office in the city of Taizz, Taizz Governorate. Monthly salary: 30,500 rial (US$ 171, euro 117). Nadja Ali Gayt is an adviser at the Ministry of Agriculture’s education center for rural women in the district of Manakhah, Sana’a Governorate. Monthly salary: 28,500 rial ($160, €110). Constantino Ayaviri Castro (b. 1950), previously a construction worker, is a police officer, third class, for the municipality of Tinguipaya, Tomas Frias province. The police station does not have a phone, car or typewriter. Monthly salary: 800 bolivianos ($100, €189). Marcial Castro Revollo (b. 1942) is shopkeeper and, at the desk in the back, civil servant for the Registry of Births, Deaths and Marriages in the village of Millares (350 inhabitants), municipality of Betanzos, Cornelio Saavedra province, Department Potosi. Also, at the desk in the front, he is responsible for the polling station of the Corte Departemental Electoral de Potosi (elections office). Monthly salary: 500 bolivianos (euro 55, US$ 62). 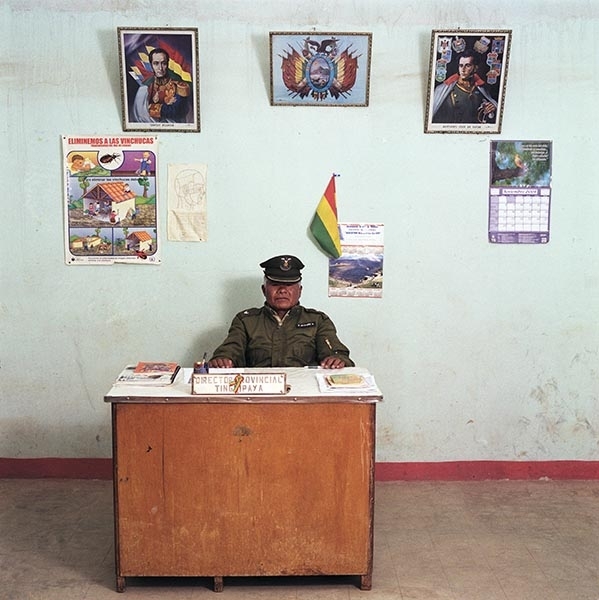 Bolivia (2005) — David Ruiz Doro (b. 1972) is chief of urban and environmental projects at the Department of Public Works’ Technical Division of the municipality Potosí, the capital of the department by the same name. Monthly salary: 2,400 bolivianos (euro 267, US $299). Jan Banning was born in the Netherlands in 1954 from Dutch-East-Indies parents. 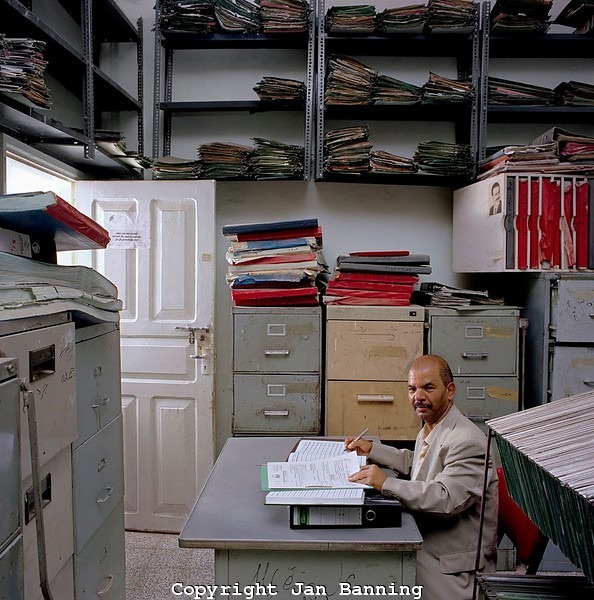 He studied social and economic history at the University of Nijmegen, and has been working as a photographer since 1981. 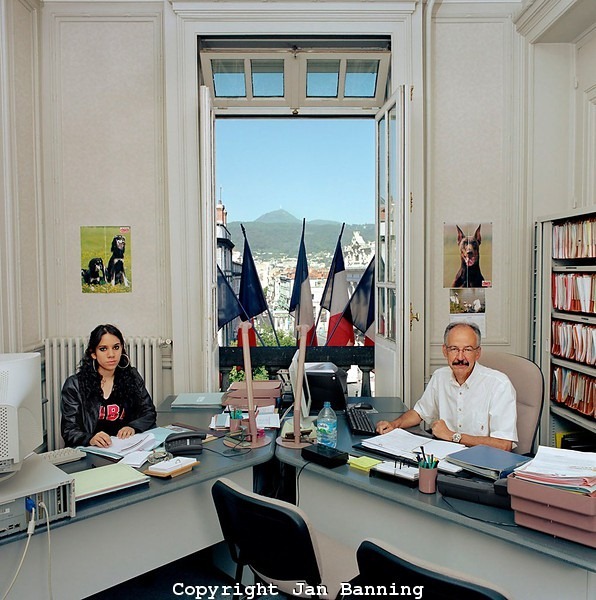 The central theme of Banning’s practice is state power, having produced series about the longterm consequences of war and the world of government bureaucracy. Das Projekt sucht noch Paare in Hamburg! Dies bekräftigt uns in dem Vorhaben, das Projekt von Mai bis September 2011 fortzuführen und dafür – genauso wie Beate und Heinz Rose 1971 – durch ganz Deutschland zu reisen und in zwölf Städten und Region von Sylt bis München 150 bis 200 Paare zu fotografieren. Hauptziel des Projektes ist es, wieder ein Buch mit etwa 80 bis 100 Fotografien zu veröffentlichen. Der Kölner Verleger und Fotobuchhändler Markus Schaden hat vor rund zwei Jahren die komplette Restauflage von Beate und Heinz Roses Buch aufgekauft und hat bereits großes Interesse bekundet, auch unsere Fortführung als Buch zu veröffentlichen. Für unser Projekt wollen wir in diesem Jahr 150 bis 200 Paare in ganz Deutschland fotografieren. Natürlich können wir nicht in jeden Winkel unseres Landes reisen, aber wir versuchen, möglichst flächendeckend unterwegs zu sein. 13 Städte und Regionen haben wir dafür ausgesucht und sie auf drei Routen, für die wir jeweils rund zwei Wochen unterwegs sein wollen, verteilt. Die Nord-Route führt uns zunächst am 12. Mai nach Dortmund. Danach geht es weiter nach Sellstedt bei Bremerhaven (15. Mai), nach Sylt (18. Mai) und Hamburg (22. Mai). Wer mitmachen möchte oder aber jemanden kennt, der vielleicht mitmachen möchte, sollte sich schon jetzt bei uns melden: Wir sind grundsätzlich an jedem Paar, das seinen Wohnsitz in Deutschland hat, interessiert. Sobald wir die konkrete Planung für eine Stadt aufgenommen haben, erhaltet ihr über einen entsprechenden Link auf den Städtenamen weitere Informationen zum Shooting wie Ort und Zeit. Außerdem suchen wir noch nach geeigneten Orte, an denen wir fotografieren können und die uns jemand kostenlos für einen Tag zur Verfügung stellen kann – zum Beispiel Ateliers oder Tageslichtstudios mit mindestens drei Meter Deckenhöhe. Scheunen, Autohäuser, Turnhallen und Foyers mit Tageslicht würden aber natürlich auch bestens funktionieren. Wenn uns jemand mit einer Übernachtungsmöglichkeit unterstützen möchte, wären wir ebenfalls sehr dankbar. Hier mehr Info über das Projekt oder die Teilnahme. President Obama’s decision not to release images of Osama bin Laden’s corpse, and the heated debate it has engendered, speaks volumes about the continuing power of the photograph even in a time when we are overwhelmed by digital images of every hue, from the mundane to the ultra-explicit. Others – most notably more hawkish Republicans and their supporters in the US media – argue that the images should be released precisely to show that this is “who we are”: an America that wants the world to know in the most graphic terms what happens to those who attack their country. Photography, for better or worse, possesses this immediate power in a way that words – too reflective – and the moving image – too animated – do not. It is a moment, freeze-framed forever. 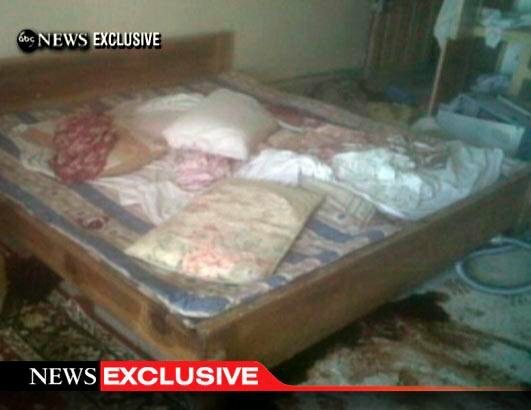 Could an image of Bin Laden’s bloodied corpse send out the same message to his followers? Almost certainly, and we will no doubt see that power soon enough when the photographs leak out into the media, as they surely will – with or without Obama’s sanctioning. More problematic for Obama’s moral reasoning is the fact that other graphic images of the aftermath of the attack on Bin Laden’s compound have already been leaked, showing the bloodied corpses of unidentified men. 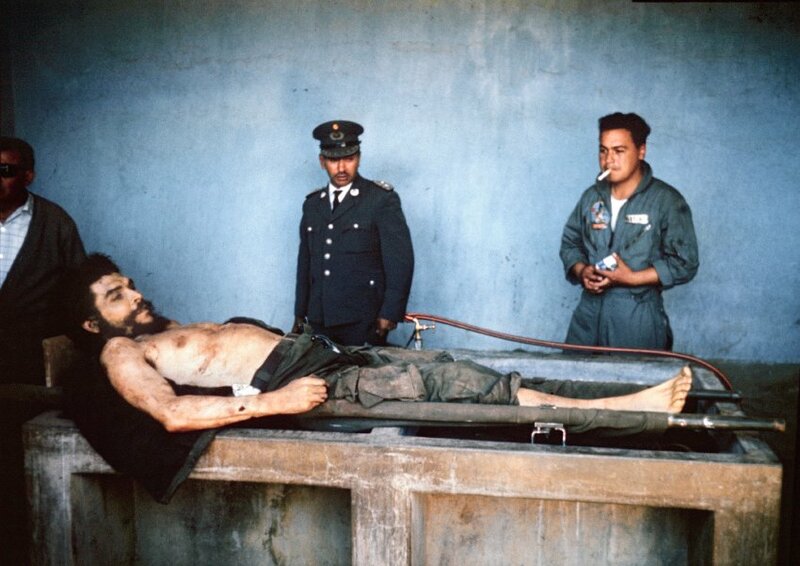 Why is it acceptable to show these bodies but not that of their leader, a figurehead for global terrorism? Indeed, why show such graphic images at all? In her recent book, The Cruel Radiance: Photography and Political Violence, the American academic Susie Linfield argues that, in the internet age, we must regain our ability to distinguish between gratuitous images of violence and hardship – including “the onslaught of images from the Muslim world that celebrate suicide bombings, beheadings and other forms of barbarism” – and more morally defensible images of war and conflict, however explicit. “If we want to construct a politics of human rights that isn’t merely an abstraction, we need to look at these photographs of suffering, degradation and defeat,” she writes. “We need to think clearly not only about the relationships among these images, how they function and what they communicate in aggregate, but about the specific conditions each one depicts, no matter how disturbing, shaming and bewildering an experience that may be.” One senses that Linfield would support Obama in his decision, especially at a time when many Americans are in no mood for painstaking and self-searching moral debates of this kind. 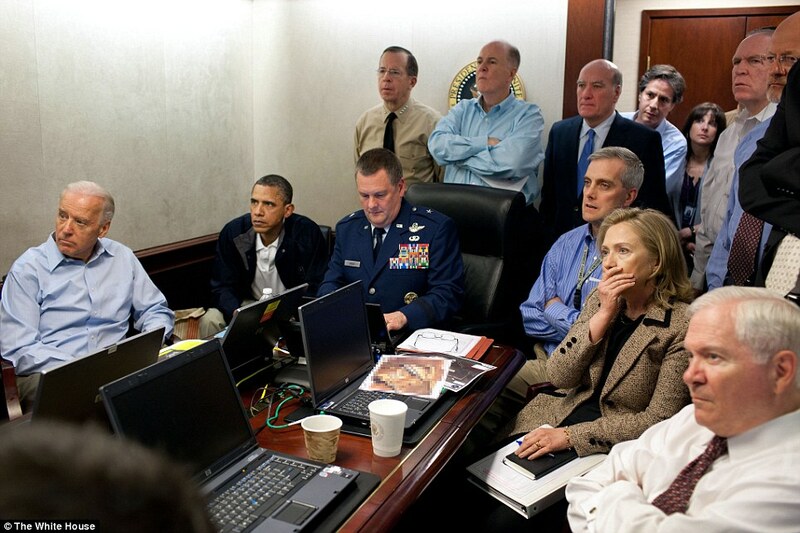 Interesting, too, is the group photograph of President Obama, Hilary Clinton and their retinue of advisers in the situation room watching Bin Laden die via a camera fixed to a soldier’s helmet. It gives some indication of the horror of the moment, if only in Clinton’s look of shock and disbelief as well as in the president’s stern gaze. 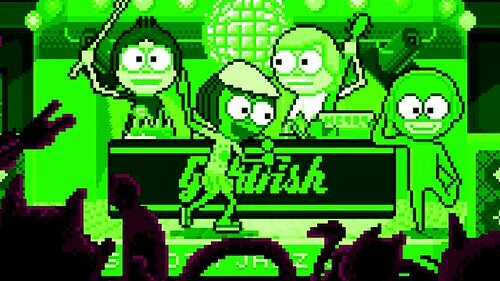 Why, though, was this image released? Perhaps because it shows no trace of celebration or gloating – “That’s not who we are” – but instead a grim acknowledgment of the horror of what is happening in all its cruel radiance. It is a fascinating document, for what it doesn’t show us as much as what it does. That is the often-overlooked power of great photography: to suggest rather than to shock. It’s no secret that we are a visual culture. The glow of a turned-on television illuminates every house nearly every night. Photo galleries are regularly the best viewed elements of many media sites. Pictures pack power. And politicians know this. That’s why the debate over whether or not to release what has been described as a “gruesome” photo of Osama bin-Laden’s body is so intriguing. Taken by White House official photographer Pete Souza, it shows President Obama and much of his national security team receiving an update on the mission that led to bin Laden’s death. The image powerfully portrays the tension and seriousness of purpose of the people gathered in the room. And, while the picture wasn’t taken with politics in mind, the message that it conveys — serious people doing a serious thing — is politically powerful, reinforcing the idea of Obama as a strong and sober leader. Releasing the photo of bin Laden would wipe the above image out of the American consciousness and replace it with one that is significantly more jarring and potentially divisive. Amazon.com ReviewSince the early days of photography, critics have told us that photos of political violence—of torture, mutilation, and death—are exploitative, deceitful, even pornographic. To look at these images is voyeuristic; to turn away is a gesture of respect.With The Cruel Radiance, Susie Linfield attacks those ideas head-on, arguing passionately that viewing such photographs—and learning to see the people in them—is an ethically and politically necessary act that connects us to our modern history of violence and probes our capacity for cruelty. 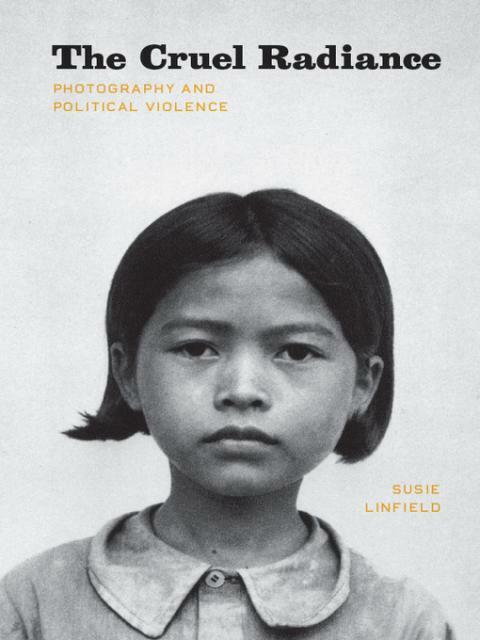 Contending with critics from Walter Benjamin and Bertolt Brecht to Susan Sontag and the postmoderns—and analyzing photographs from such events as the Holocaust, China’s Cultural Revolution, and recent terrorist acts—Linfield explores the complex connection between photojournalism and the rise of human rights ideals. In the book’s concluding section, she examines the indispensable work of Robert Capa, James Nachtwey, and Gilles Peress, and asks how photography has—and should—respond to the increasingly nihilistic trajectory of modern warfare.A bracing and unsettling book, The Cruel Radiance convincingly demonstrates that if we hope to alleviate political violence, we must first truly understand it—and to do that, we must begin to look. An Argentinian photographer who began his career on local papers last night picked up one of his art form’s leading awards for a portfolio of pictures he took while living with islanders in the Paraná river delta, Argentina. Alejandro Chaskielberg’s dramatically luminous images of a community going about their daily lives won him photographer of the year – known as L’Iris D’Or – at the Sony World Photography Awards, presented last night at a gala ceremony at the Odeon Leicester Square in London. 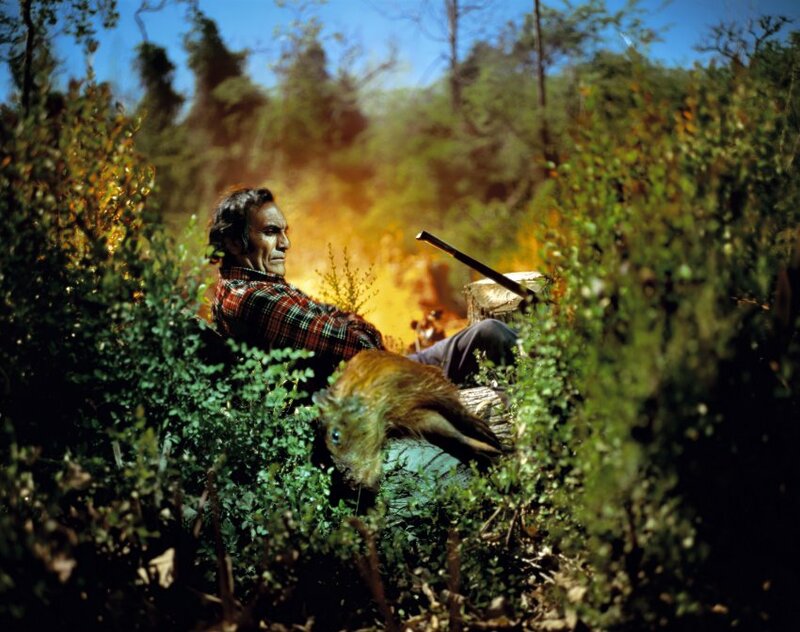 He beat considerable competition, with 105,000 images entered from 162 countries. Auf Deutsch y en espanol. Here Chaskielberg’s Blog and Web. 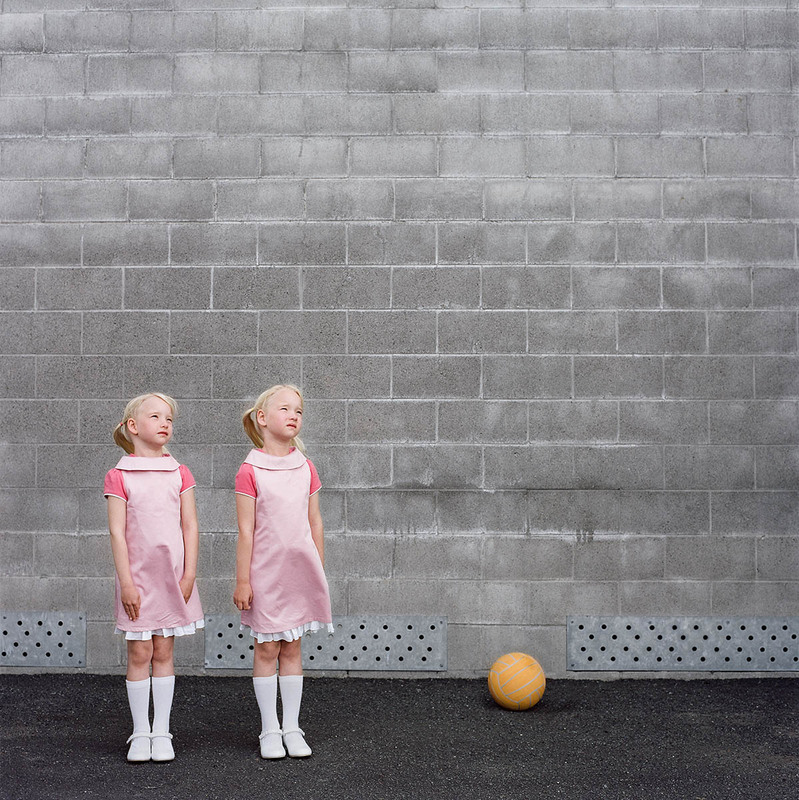 All the Sony World Photography Awards 2011, winners and categories can be found here. Der Modefotograf Bruno Bisang hat nicht nur mit den ganz großen der Modelwelt zusammengearbeitet wie Carla Bruni, Naomi Campbell, Tyra Banks oder Monica Bellucci. 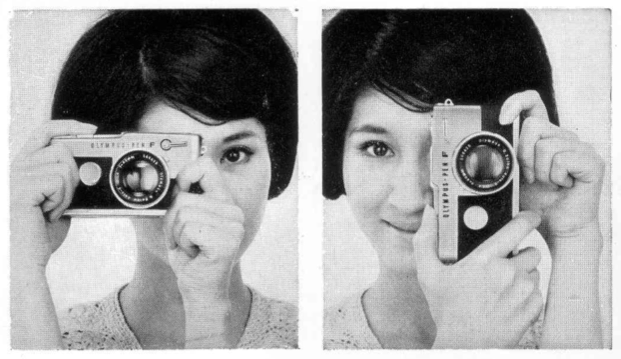 Bisang ist auch Fan von Polaroid-Fotos. Und so hat er am Set nicht selten auch auf den Auslöser seiner Sofortbildkamera gedrückt. Diese Bilder werden jetzt in einer Kölner Galerie gezeigt. Bruno Bisang wurde 1952 geboren und verbrachte den größten Teil seiner Jugend in dem Städtchen Ascona im italienischsprachigen Teil der Schweiz. Mit neunzehn Jahren besuchte er die Fotografieklasse der Kunstgewerbeschule Zürich und absolvierte anschließend eine Fotografenlehre. Seit 1979 ist Bruno Bisang als freier Fotograf tätig, zunächst in Zürich, dann eine Zeit lang in Mailand und München. Heute arbeitet er abwechselnd in Mailand, New York, Paris und Zürich. Aunque usted no lo crea, la primavera llegó a Hamburgo! Believe or not: spring has finally arrived!